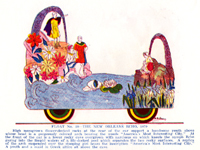 The Krewe of NOR, the first Carnival parading Krewe for children, was formed in 1933-1934 by a group of men from the Convention and Visitors Bureau of the New Orleans Association of Commerce. NOR's "members" were the public and parochial school children of New Orleans (in the segregated New Orleans of the time, this meant the white school children only), along with Boy and Girl Scout troops and school bands. The krewe's adult committee members supplied each school with funds to build a float and the schools provided float riders with costumes sewn by the students of F.T. Nichols -- later L.E. Rabouin -- Technical School or by the mothers of students in the various schools. The court of NOR was chosen by a public drawing held at City Hall. NOR (or "New Orleans Romance") paraded from 1934 to 1940 and again in 1948 and 1949, always with over fifty floats and thousands of children. 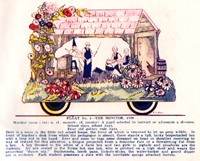 In 1940, the theme of the parade was "The Press of New Orleans," and each float represented one of the newspapers published in New Orleans throughout history. The King of NOR that year was Frank Sehrt of St. Dominic School; the Queen was Doris Mae Garritty of Walter C. Flower School. The 55 floats were pulled through the streets by school boys, and, at Gallier Hall, Mayor Robert S. Maestri toasted the King with soft drink. 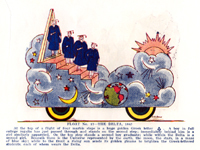 The images here are from a booklet published by NOR with illustrations of the 55 floats in the 1940 parade. 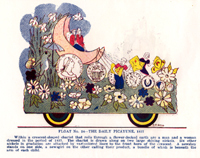 (Note that in the captions for each float, some of the dates when newspapers began publication are incorrect. The Monitor (or Moniteur) was founded in 1794, the Bee in 1827, the Daily Picayune in 1837, and the Times-Democrat in 1881. But, after all, who says Mardi Gras floats have to be accurate!